The connection between siblings is hard to describe in words, but you know it when you see it. If you spend 30 seconds around Hunter and William, you’ll see what we mean. Their brotherly bond is unmistakable and profound. 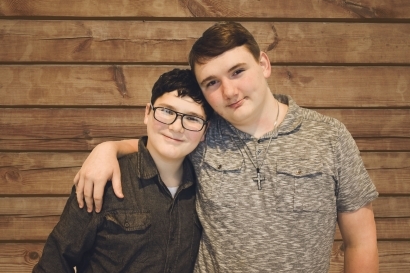 Each brother loves the other tremendously, but younger brother Hunter is extremely attached to William, and can get in a little trouble when he’s not allowed to spend time as much time with him as he’d like. Controlling his emotions when he gets upset is Hunter’s biggest goal, and he’s made some great progress. William is a little more laid-back, but he struggles with letting go of being a parent to Hunter instead of a big brother, but this has faded over time as he’s worked to understand his true role in their relationship. When they’re allowed to just be brothers, they both love being outside and playing together. Hunter is not a picky eater at all, but William could live off of pizza and Dr. Pepper if you let him! They both love animals, too, and sports is another common interest. So what kind of family do these two need to continue their journey together? A two-parent household with experience parenting. These guys need a family who know the ropes and can show them what a family is all about with support, love, accountability, and togetherness. Pretty simple formula, isn’t it? If you’d like to learn more about Hunter and William, let us know.